The sizing makes Middie tricky to dress because she is so much skinnier and shorter than Blythe is. Like the Neos, Middies have been faked on the online market, but she is still easy to find via legitimate doll-buying channels (such as Junie Moon and CC-Toys). When in doubt of the legitimacy of a doll online – always ask questions. I find that it’s easier to find truthful sellers in the collectors’ community than with eBay shops, but for the most part you can compare the photos of the dolls with official release promotional photos, especially if you are buying a stock Middie doll. 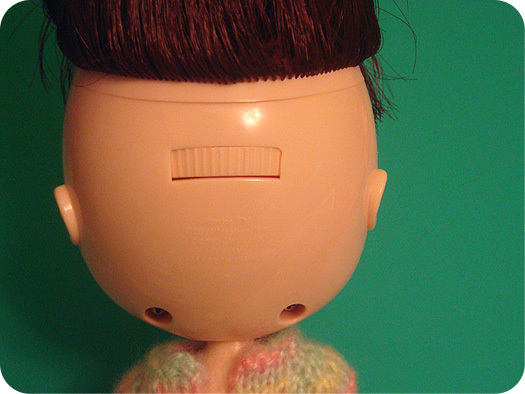 If you’re buying a custom doll, be sure to ask questions if you want to know what the base doll was – the customizer should be able to tell you. Despite the fakes and the sizing issue, the nice thing about Middie is that she does fit Kelly shoes, and other similar-sized Barbie little sisters – the unfortunate thing is that once people in the Blythe community discovered this fact, the prices of Kelly shoes did raise on eBay. The size of the head is significantly smaller, same with the height. 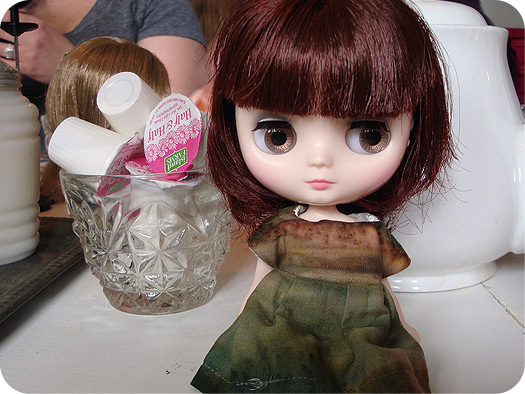 I’ve found very few clothing items that I had for Blythe that also work for Middie – notably a short empire waist top that works as a loose dress on Middie. Middie is shorter, slimmer, and her legs have the same general thickness all the way down. Her feet are very small though, when you put a pair of Neo shoes onto a Middie, it’s always like a toddler playing dress-up with a parents’ shoes. Overall, I’ve had to rethink how to dress Middie because her sizing doesn’t lend to the Blythes’ wardrobe to being very flattering on her. Middie’s eye mechanism is different from Blythe’s. She lacks a pull ring and pull string, instead she has a dial on the back of her head. Moving the dial from left to right moves the eyes from looking left to right. Her head also tilts from side to side, unlike that of Blythe (on a stock body) which can only turn and not tilt. Middie continues to be fairly well-priced. While she was thought to be overpriced initially, especially compared to Blythe and the lack of a changing eye-mechanism, she has been well received by the Blythe community overall. There are even some sources for Middie eyechips on Etsy (which fit in differently than Blythe eyechips do – do not attempt to pull them out through the eye socket!). Middie gets customized, finds herself on different bodies, and there has been more and more individuals who are interested in creating a fashionable wardrobe for Blythe’s middle sister. While she cannot share clothing readily with Blythe, boots can be shared and that adorable head tilt is something to behold in person. I do love the look of the Middie Blythes – but I think as a new collector I’m just focused on gaining my first ‘proper’ Blythe, a Neo, for now! Because they’re more affordable, do Middies get customised more, do you think? 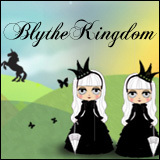 PS, I’ve just started reading your blog and it’s SO helpful and has been a fab intro to the Blythe world ???? I think that Neo-sized Blythes tend to get customized more, because they are more popular compared to Middies. I know some customizers charge more for Middies because they’re (allegedly) a pain to take apart – much like how some charge more for customizing SBLs. 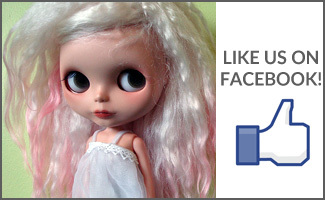 I, personally do not own any Blythe dolls but both of my grown daughters, currently at home, do. I adore the “girls”, as we call them, and my daughters have all three sizes, which brings me to middles. Clothing is difficult to find, especially shoes! Thanks for the info regarding where to find and what may fit. I recently broke down and ordered a fakie Blythe and read that bratz clothing fit perfectly. Of course I wasn’t paying attention and ordered “bratz kids” doll clothes and they are TINY!!!!! (Won’t fit my daughter’s monster high dolls (that’s how I know they will be too small for Blythe). But I’m wondering if they would fit a Middie. As I’m new to the Blythe world and won’t get my doll for several weeks yet I have no clue about their sizing. I wouldn’t know – I’ve never seen a Bratz Kids doll before, so I’m not sure about their sizing. I tried looking up photos of the small Bratz dolls, but couldn’t get much of a feel for their size. I guess you’ll find out! Some Bratz clothing will fit Blythe, I’m not sure about all. I know people have had a lot of luck with Bratz jeans fitting Blythe though! 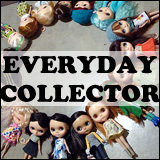 Could you talk about non-standards blythe sizes, like the miniature ones by Nina Corali? Thanks! Hi Sarah! The miniature ones by Nina are handmade by her (I did an interview with her last year in February, click here to read it). I primarily write about Kenners, Neos, Middies, and Petites because those are the manufactured dolls. Hope that helps, cheers!